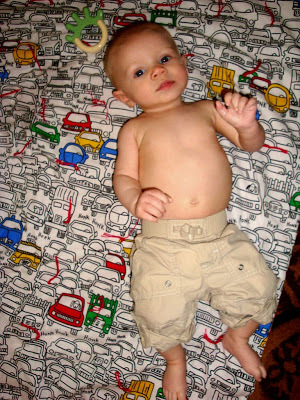 Home ParentingRaising BoysOscarMonthly Updates	4 months! Ladies and Gentlemen, Oscar is 4 months old today! The past month has gone by super fast. I am sure the next 40 years will follow suit. Oscar is really coming into his own these days. I can see that he is becoming more confident in public places and enjoying life a little bit more each day. He is teething full time and one day we will meet that first tooth. For now, he just chews on everything he can reach! He has started passing objects from one hand to the other and of course bringing them to his mouth. 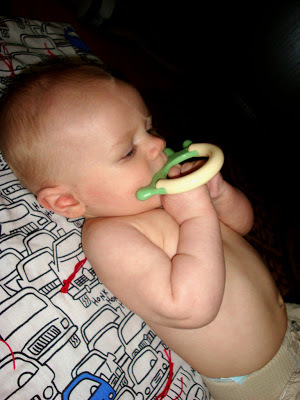 Favorites right now are his burp cloths, plastic rings and his new teether that we just got from Whole Foods! It’s great because one side is softer so it has some give to it and it’s made from cornstarch so it’s safe to munch on. Every time it comes into Oscar’s line of sight, he drops everything and goes for it. It’s super cute. He’s still working on rolling over. He has gone from tummy to back a few times and every now and again he will roll to one side from his back. Usually when under his play gym and going for a toy that is just out of reach. Otherwise he just isn’t that interested. 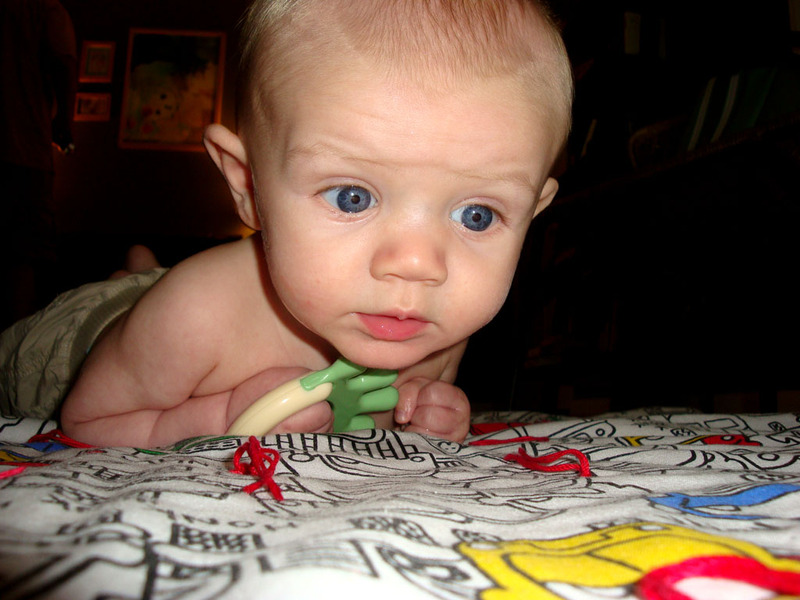 However, the last few times I put him on his tummy, he was trying to get his feet up underneath him and move forward. He managed to scoot a tiny bit (like a centimeter) and this morning he actually put some weight on one foot and one knee and then fell back down. I think he tried to do it again, but didn’t know what he did or how. It will be interesting to see if he keeps trying! For the most part, he doesn’t really seem to want to be mobile. He is showing a preference for being upright but he prefers mommy-assisted standing to sitting in the Jumper. I think once he gets that jumping is really easy and fun, he’ll like it more. 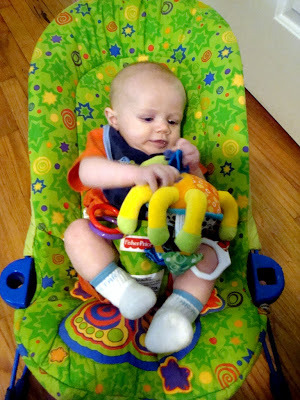 He still loves his bouncy seat but is enjoying bouncing himself more than getting the lights and music to come on so we leave that part off most of the time. I’m glad because I want him to look around and enjoy his surroundings rather than stare at a blinking light all day! As for his sleep, I think we have settled into a pattern after our comprehensive look into his sleep habits. Right now, Oscar takes a 2 hour nap in the morning, a 1.5-2hour nap around lunchtime and about a 1 hour nap in the afternoon. He typically goes to bed by 7:30-8pm and get’s up for the day at 6:30am. I can guarantee one wake up overnight to nurse, but it’s sometimes 2 or 3. However, the past 5 days have been 3 nights with one waking and 2 with 2 wakings so I feel totally blessed with that! We are also getting out and about more which has been really fun! Friday, Oscar and I hung out with Holly and Amy and their kids in Durham. It was such a great time to chat and hang out with friends and all the babies. Then yesterday, Jerry and I took Oscar for his first time disc-golfing! We met Joe, Paige and Daniel at the park. The guys played while Paige and I walked along with the kids. Oscar did great at both outings and I really had a great time connecting with other moms. I really hope to make a habit of it! We have Oscar’s 4 month Dr. appointment one week from today so I’ll have some stats then. It’s a little late but I don’t mind. I can’t believe it’s almost June! So crazy. Time really does fly.